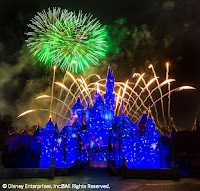 So, who's going to Disneyland Friday for the park's 60th birthday party? I am! I hope you are too. Sadly, Anthony won't be joining us for the festivities, so let's try not to have too much fun in his absence. Disneyland's Diamond Celebration will be a somewhat low-key event (especially for those of us who remember the 50th). Contrary to earlier rumors, Disneyland and DCA will not be open 24 hours like they were Memorial Day weekend. Disneyland will be open 8:00 a.m. to midnight, DCA from 8:00 a.m. to 11:00 p.m. As far as special events during the day, Disneyland Resort president Michael Colglazier will preside over a rededication ceremony in Town Square. 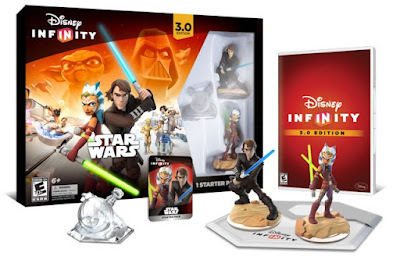 The event will be streamed live on big screens set up throughout Disneyland, DCA and Downtown Disney. There will also be special late-night performances of World of Color and Paint the Night. Guests are also encouraged to dress in 1950s-style garb just like it was on Disneyland's opening day. For a complete list of activities this Friday, visit https://disneyland.disney.go.com/calendars/day/2015-07-17/. 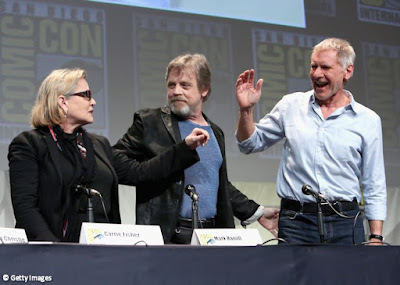 Carrie Fisher, Mark Hamill and Harrison Ford at Comic-Con. Harrison Ford made a surprise appearance at Comic-Con last week. He joined J.J. Abrams and the cast of Star Wars: The Force Awakens on stage in Hall H to the delight of the packed audience. It was his first public appearance since March when he crashed landed a vintage airplane on a golf course in Southern California. Christopher Miller and Phil Lord, the directing duo that helmed The Lego Movie, will direct a standalone Star Wars film that tells the backstory of Han Solo. Lawrence Kasdan is working on the script and the film is expected to be released on May 25, 2018. 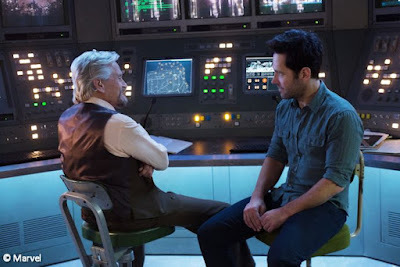 Michael Douglas and Paul Rudd in Ant-Man. Ant-Man is getting mostly favorable reviews (75% on Rotten Tomatoes as of this post). 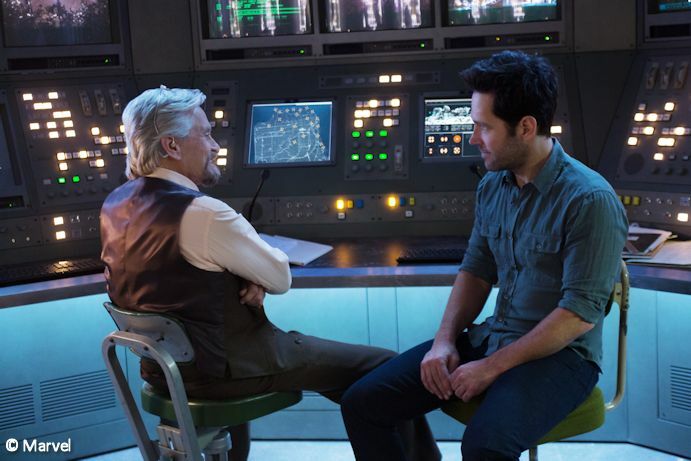 The latest tale in the Marvel Cinematic Universe stars Paul Rudd, Michael Douglas, Evangeline Lilly and Corey Stoll. It opens in U.S. theaters this Friday. John C. Reilly has confirmed that there will be a Wreck-It Ralph 2 and he will again be voicing the title character. Expect there to be a bigger Nintendo tie-in like we talked about previously Inside The Mouse Castle. Marisa Tomei will play Peter Parker's guardian Aunt May in the upcoming MCU Spider-Man films. Is it wrong to be hot for Aunt May? Who says princesses get all the attention? Disney is developing a film centered around the life of Prince Charming. Personally, we think Prince should play the prince. Disney Infinity 3.0 will hit stores (finally) on August 30, 2015. It will have Star Wars in it. That's all you need to know. Order it. Now. By a 3-2 vote, the Anaheim City Council passed an ordinance extending a gate-tax ban for the Disneyland Resort for an additional 30 years. Anthony continues to be bored by this type of news. Bill Cosby and the Confederate Flag can no longer be found at Walt Disney World. Anthony and I make inappropriate jokes about it.